The identification and characterization of viral epitopes across the Human Leukocyte Antigen (HLA) polymorphism is critical for the development of actives-specific or adoptive immunotherapy of virally-mediated diseases. This work investigates whether cytokine mRNA transcripts could be used to identify epitope-specific HLA-restricted memory T lymphocytes reactivity directly in fresh peripheral blood mononuclear cells (PBMCs) from viral-seropositive individuals in response to ex vivo antigen recall. PBMCs from HLA-A*0201 healthy donors, seropositive for Cytomegalovirus (CMV) and Influenza (Flu), were exposed for different periods and at different cell concentrations to the HLA-A*0201-restricted viral FluM158–66 and CMVpp65495–503 peptides. Quantitative real time PCR (qRT-PCR) was employed to evaluate memory T lymphocyte immune reactivation by measuring the production of mRNA encoding four cytokines: Interferon-γ (IFN-γ), Interleukin-2 (IL-2), Interleukin-4 (IL-4), and Interleukin-10 (IL-10). We could characterize cytokine expression kinetics that illustrated how cytokine mRNA levels could be used as ex vivo indicators of T cell reactivity. Particularly, IFN-γ mRNA transcripts could be consistently detected within 3 to 12 hours of short-term stimulation in levels sufficient to screen for HLA-restricted viral immune responses in seropositive subjects. This strategy will enhance the efficiency of the identification of viral epitopes independently of the individual HLA phenotype and could be used to follow the intensity of immune responses during disease progression or in response to in vivo antigen-specific immunization. T cell-directed active or adoptive immunotherapy is an emerging treatment option for chronic viral infections, virally-mediated diseases, and virally-induced cancers. Several virally-induced cancers are caused by relatively common latent viral infections. Epstein Barr Virus (EBV) can induce post-transplant lymphoma , Burkitt's lymphoma, Hodgkin's disease , and nasal pharyngeal carcinoma . Simian virus 40 (SV40) has been associated with mesothelioma [4, 5] and Human Papiloma Virus (HPV) with cervical cancer  and it appears that T cell reactivity may control their growth. Thus, we have been interested in tools that allow for a simplified and flexible screening of relevant anti-viral immune responses in seropositive subjects. Among such methods we found particularly suitable the detection of cytokine mRNA levels produced by immune cells in response to viral-epitope stimulation. This method involves the detection of cytokine mRNA levels after a short-term ex vivo sensitization of peripheral blood mononuclear cells (PBMCs) from seropositive individuals exposed to human leukocyte antigens (HLA)-associated viral-epitopes. Cytokine transcript levels were assessed by quantitative real-time PCR (qRT-PCR). Others have used a similar approach to monitor the kinetics of cytokine induction following polyclonal epitope activation [7, 8]. Cytokine transcript measurement by qRT-PCR has also been used to determine the cytokine profile of tumor microenvironment  or to monitor cancer-specific immune responses . Kammula et al. pioneered cytokine transcript monitoring by investigating cytokine mRNA expression by melanoma antigen-specific CD8+ T cells in melanoma metastases from patients undergoing epitope-specific vaccination . Recently, cytokine level assessment by qRT-PCR has been used to monitor immune response to other tumors such as soft tissue limb sarcomas after loco-regional therapy . Although the assessment of cytokine production by lymphocytes following stimulation with viral peptides has been characterized after long term in vitro cell culture , the direct ex vivo reactivation of memory T lymphocytes from seropositive healthy donors exposed to HLA-associated viral epitopes has not been full characterized [14, 15]. Direct ex vivo sensitization has several advantages over in vitro assays; it is simpler and independent of biases introduced by exposing immune cells to arbitrary doses of growth factors routinely used in culture such as Intereukin-2. This assay is a direct quantitative estimate of the immune reactivity toward a given epitope. A subtle but more important advantage of ex vivo testing of immune reactivity consists in the identification of easily detectable immune specificities likely to be immunodominant in the context of a given disease and HLA phenotype. Thus, such strategy should be considered an easy screening tool for the identification and characterization of immunodominant epitopes that can be readily applied to any individual independently of HLA phenotype through the utilization of overlapping peptide libraries. The aim of this study was to characterize the usefulness of cytokine mRNA determination following exposure of PBMCs from human viral-seropositive to relevant epitopes in determining individual immune competence to known immunodominant determinants. Peptides from Influenza A virus matrix protein M1 (FluM158–66) , Cytomegalovirus matrix protein 65 (CMVpp65495–503) , and from the Tumor Associate Antigen (TAA) Mage-12 (Mage12170–178)  were used to analyze peptide-specific T cell memory reactivation in three HLA-A*0201 homozygous healthy donors. The short-term kinetics of Interferon-γ (IFN-γ), Interleukin-2 (IL-2), Interleukin-4 (IL-4), and Interleukin-10 (IL-10) were determined by measuring qRT-PCR amplification products. Monitoring of cytokine mRNA production was performed at different time points (from 3 to 48 hours), to select the cytokine with the consistently higher mRNA expression level within the shortest period and to compare this molecular response to short-term protein production evaluated by flow cytometry and ELISA. The study found that mRNA cytokine analysis of seropositive subjects after ex vivo viral and/or tumor peptide exposure is a simple and valid alternative to other methods that test epitope-induced T lymphocyte reactivation. The simplicity and sensitivity of this method in identifying immune dominant epitopes makes it suitable for the investigation of clinically relevant T cell response. The HLA-A*0201-restricted Influenza A virus matrix protein M158–66 peptide (FluM158–66, GILGFVFTL), the HLA-A*0201-restricted CMV phosphorylated matrix protein 65495–503 peptide (CMVpp65495–503, NLVPMVATV), and the HLA-Cw*0702-restricted irrelevant peptide Mage-12 (Mage12170–178, VRIGHLYIL), were synthesized with a purity from 90 to 100% as determined by High Pressure Liquid Chromatography (HPLC) analysis (Princeton Biomolecules, Langhorne, PA, USA). Each peptide was dissolved in 25% dimethyl sulfoxide (DMSO) at the final concentration of 1 mg/mL. Up to 50% DMSO was added to those mixtures of peptide that did not dissolve immediately. The peptide solutions were stored at 4°C and replaced every month. After obtaining informed consent, a lymphapheresis was performed on four healthy subjects at the Department of Transfusion Medicine (DTM), Warren G. Magnuson Clinical Center (CC), NIH, Bethesda, Maryland using a CS3000 Plus blood cell separator (Fenwal, Baxter Healthcare Corporation, Deerfield, IL). All donors were HLA-A*0201 homozygous. High resolution HLA class I genotyping was performed by sequence-specific PCR using genomic DNA (HLA Laboratory, DTM, CC, NIH, Bethesda, MD). The presence of IgG and IgM CMV antibodies in each donor was analyzed by passive latex agglutination (CMVSCAN kit, Becton Dickinson Microbiology System, Cockeysville, MD). Two of the three donors were seropositive for CMV. The donors were not tested for antibodies to Influenza A since almost all individuals are seropositive. 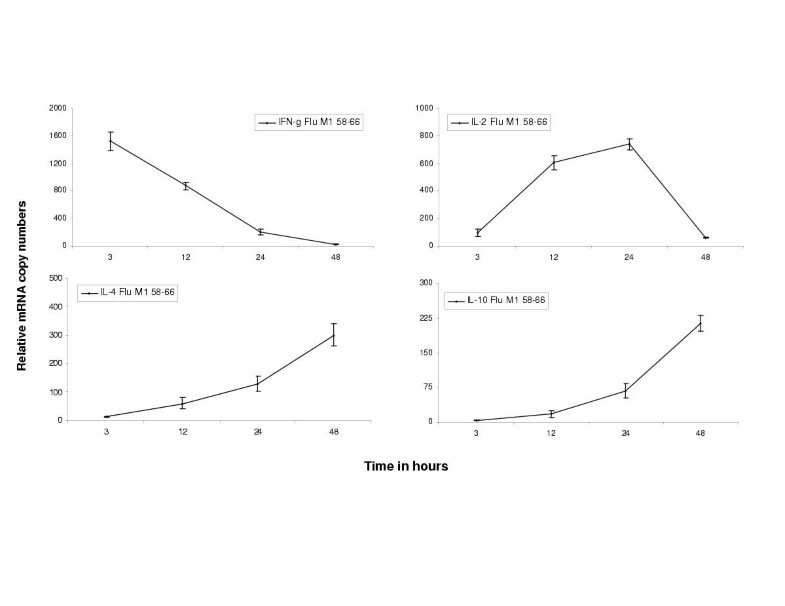 PBMCs from apheresis products were separated from red blood cells and platelets by Ficoll (Pharmacia Biotech, Wilkstrom, Sweden) density gradient centrifugation. To eliminate residual erythrocytes, an ACK Lysis Buffer (Bio Whittaker, Walkersville, MD) at 1:10 dilution was used while platelets were removed by washing cells twice in HBSS (Biofluid, Rockville, MD) at 800 RPM for 10 min. For the short-term qRT-PCR assays, immediately after PBMCs were isolated, cells were plated in a 96 U-bottom well plate with RPMI (Biofluid, Rockville, MD) complete medium (10% human serum, Gemini Bio-Products, Woodland, CA; supplemented with 1% HEPES, Biofluid) at concentrations of 1 × 105, 2 × 105, 1 × 106, 2 × 106cells/200μl (starting concentrations of 5 × 105, 1 × 106, 5 × 106, 1 × 107cell/ml). 2 × 105cells/200μl has been considered the standard concentration of cells enable to produce a significant amount of IFN-γ transcripts, as previously reported  The cells were incubated overnight (18 hours) at 37°C (humidity 90%, CO2 5%) to minimize background expression of cytokine due to lymphocyte manipulation. The next day, the PBMCs were directly exposed to individual peptides at a final concentration of 1 μl/mL and incubated at 37°C from 3 to 48 hours according to experimental conditions. After each incubation period the cells were harvested and used for the measurement of cytokine transcription by qRT-PCR following total RNA extraction and cDNA synthesis. After incubation, cells where harvested, washed, and total RNA was extracted using an RNeasy Mini Kit (Qiagen, Valencia, CA) following the manufacturer's instructions. To optimize lysis and homogenization when greater than or equal to 1 × 107 cells were tested, 700 μl of lysis buffer was used. Total RNA was eluded from columns into a final volume of 30 μl RNase free water and stored at -80°C or immediately used for cDNA synthesis. One to 5 μg total RNA stored at -80°C or rested at 4°C (on ice) immediately after extraction were transcribed into cDNA using the SuperScript pre-amplification system (Invitrogen, Carlsbad, CA). Briefly, total RNA was heated at 70°C for 10 minutes with 1 μl oligo (dT) primers (0.5 μg/μl) in a final volume of 12 μl. After cooling samples at 4°C for 1 min, 7 μl of RT-PCR mixture (2 μl 10 × RT Buffer, 2 μl 25 mmol of MgCl2, 1 μl dNTP 10 mmol, and 2 μl 1 M DTT) were added to samples. They were held at 42°C for 5 min. Then, 1 μl Superscript RT II (50 U/μl) was added to each sample (final volume 20 μl) and cDNA synthesis was performed using these PCR parameters: 42°C for 50 min and 70°C for 15 min. The samples were thus held at 37°C for 20 min with 1 μl RNase to avoid RNA contamination. Synthesized cDNA was stored at -20°C until use. IL-2, IL-4, IL-10, and -actin genes primers and TaqMan probes (Applied Biosystem, Foster City, CA) (Table 1) [9, 19] were designed to span exon-intron junctions in order to prevent amplification of genomic DNA and to produce amplicons <150 base pairs (bp) enhancing the efficiency of PCR amplification. TaqMan probes were labeled at the 5'-end with the reporter dye molecule FAM (6-carboxyfluorescein; emission λmax = 518 nm) and at the 3'-end with the quencher dye molecule TAMRA (6 carboxytetramethylrhodamine; emission λmax = 582 nm). In order to create a standard curve, the cDNA was generated by reverse transcription using a technique identical with the one used for the preparation of test cDNA. Thereafter, cDNA of IFN- IL-2, IL-4, IL-10, and -actin genes was amplified by means of regular PCR using the same primers designed for the qRT-PCR and following these parameters: 10 min at 95°C (1 cycle), 30 sec at 95°C, 30 sec at 60°C and 2.5 min at 72°C (40 cycles) and 5 min at 72°C (1 cycle); final volume 50 μl. Amplified cDNA was then purified and quantitated by spectrophotometry (OD260). The number of cDNA copies was calculated using the molecular weight of each gene amplicon. Serial dilutions of the amplified gene at known concentrations were tested by qRT-PCR. Quantitative RT-PCR reactions of cDNA specimens and cDNA standards were conducted in a total volume of 50 μl with 1× TaqMan Master Mix (Applied Biosystem, Foster City, CA) and primers and probes at optimized concentrations (primer 400 nmol and probe 200 nmol) in a 96-well optical reaction plate (Applied Biosystem, Foster City, CA). Thermal cycler parameters were 2 min at 50°C, 10 min at 95°C, and 40 cycles involving denaturation at 95°C for 15 sec and annealing/extension at 60°C for 1 min; final volume 50 μl. Real time monitoring of fluorescent emission from the cleavage of sequence specific probes by the nuclease activity of Taq polymerase allowed definition of the threshold cycle during the exponential phase of amplification. Standard curves generated for IFN- IL-2, IL-4, IL-10, and -actin genes were found to have excellent PCR amplification efficiency (90–100%; 100% indicates that after each cycle the amount of template is doubled) as determined by the slope of the standard curves. Linear regression analysis of all standard curves was > 0.99. Standard curve extrapolation of gene copy number was performed for all genes studied. Normalization of values was performed by dividing the copies of the genes of interest (IFN-γ, IL-2, IL-4 and IL-10) by the copies of the reference gene (β-actin). All standard and sample PCR assays were performed in triplicate and reported as the average. Quantitative real time PCR primers and probes for evaluating the four cytokines of interest and the reference genes. Freshly isolated PBMCs from seropositive donors at a concentration of 1.5 × 106 cells/ml of RPMI complete medium (without HEPES, Biofluid, Rockville, MD) were rested overnight in a 14 mL polypropylene tube (Becton Dickinson, Franklin Lakes, NJ) and then stimulated with peptide at a final concentration of 10 μg/mL each tube. One hour after cell activation, Brefeldin A (Sigma, Saint Louis, MI) at a final concentration of 10 μg/mL was added to each tube culture. After 5 more hours (6 hours total) cells were transferred to 5 mL polsterene round bottom tubes (Becton Dickinson, Franklin Lakes, NJ) and cell incubation was stopped washing cells in 2 mL cold PBS for 5 min (1500, 4°C). Pellets were re-suspended in 1 mL PBS containing 1 mmol EDTA and tubes were incubated at 37°C for 10 min to detach adherent cells. After washing cells with 2 mL cold FACS buffer (PBS plus 0.5%BSA) by centrifugation (5 min, 1500, 4°C), cells were maintained in a 100 mL suspension for monoclonal antibodies (MoAb) extra-cellular staining. Cells were stained with 10 μl of CD3-PE and 10 μl CD8-PerCP (BD, Bioscience, San Jose, CA) for 15 min at 4°C (on ice) in the dark. After surface staining, 2 mL of BD FACS Lysing Solution (BD, Bioscience, San Jose, CA) at 1:10 dilution in PBS was added to each tube and the cells were washed by centrifugation (5 min, 1500, 4°C). Permeabilization of cells was performed by re-suspending cells in 500 μl of FACS Permeabilizing Solution 2 (BD, Bioscience, San Jose, CA) at 1:10 dilution in DEPC water, vortexing them for 30 sec and incubating them at room temperature (RT) for 10 min. The cells were thus washed twice by centrifugation (2 mL cold FACS Buffer, 5 min, 1500, 4°C). For intracellular staining, the cells were stained with either 20 μl of human anti IFN-γ-FITC or mouse IgG1 isotype-FITC (BD, Bioscience, San Jose, CA) and incubated for 30 minutes at 4°C (on ice) in the dark. After staining, the cells were washed once (2 mL cold FACS Buffer, 10 min, 1500, 4°C) and immediately analyzed on a flow cytometer or fixed in 200 μl 4% paraformaldehyde in PBS solution, kept at 4°C in the dark and analyzed later. Cell supernatants from ex vivo stimulated PBMCs sensitized at different concentrations and times of exposure were used for the measurement of cytokine protein release with an enzyme-linked immunoabsorbent assay (ELISA) kit (Endogen, Woburn, MA). Briefly, after each time point harvested cells were used for mRNA cytokine transcription while supernatant were used for protein release detection. In parallel, a 2-week in vitro sensitization was performed using PBMCs from CMV-seropositive donors. Cells were plated at a concentration of 3 × 106/2 ml of medium per well in a anti-human CD3 T-cell activation 24-well plate (Becton Dickinson, Bedford, MD) and directly stimulated with 3 μl/mL of peptide (day 0). One day later (day 1), recombinant human interleukin-2 (rhIL-2, 100 U/ml) and recombinant human interleukin-7 (rhIL-7, 10 ng/ml) (PeproTech, Rocky Hill, NJ) were added to the cell culture. rhIL-2 only (100 U/ml) was continuously administered every other day. At day 15, each group of cells was washed and directly re-stimulated in 2 mL of fresh medium with 3 μl/mL of peptide or was not re-stimulated. Eighteen hours after peptide boosting, the in vitro sensitized PBMCs were harvested. Supernatants were collected to measure IFN-γ protein release using the ELISA assay. , IL-2, IL-4, and IL-10 gene copies normalized by 105β-actin gene copies and plotted against the different times of exposure. The cytokine production, as shown, represents the mRNA copy number of the gene of interest from stimulated cells relative to the copy number of the gene of interest from unstimulated cells, in both cases after normalization by the gene of reference (β-actin). Figure 3 shows the results as mRNA copy numbers corrected by β-actin. Student's t test was used to compare cytokine mRNA release as well as cytokine protein expression by PBMCs stimulated under different conditions. ELISA results were extrapolated from a standard curve generated by linear regression. Three-color flow cytometry was performed using a FACS-Calibur flow cytometer and data were analyzed using CellQuest software. For each analysis, 250,000 events were acquired. A light scatter region was designed to include only viable lymphocytes. FACS analysis was performed on gated CD3bright expression allowing the exclusion of residual contaminating cells. The kinetics of IFN-γ, IL-2, IL-4 and IL-10 transcription following FluM1 58–66 stimulation of three HLA-A*0201 donors. The standard concentration of 2 × 105cells/200μl was ex vivo exposed to the peptide. At hour 3, IFN-γ transcript production precedes IL-2, IL-4 and IL-10. At hour 12 there is consistent production of Th1 (IFN-γ, IL-2) cytokines. IL-4 and IL-10 transcript production increases above the baseline levels from 24 to 48 hours. For each donor and at each time point mRNA copy numbers were calculated relative to unstimulated cells after normalization by β-actin. The result represents the mean ± SEM of averages of combined values of three independent experiments carried out on each of the three donors. IFN-γ transcript production by memory T lymphocytes following ex vivo FluM1 58–66 , CMVpp65 495–503, and Mage12 170–178 peptide stimulation. In the period of 3 to 12 hours, IFN-γ cytokine production was inversely proportional to the time of exposure during FluM158–66 stimulation (panel A), maintained an average level during CMVpp65495–503 stimulation (panel B) or was not produced during Mage12170–178 exposure (panel C). The results are expressed in mRNA copy numbers calculated relative to unstimulated cells after normalization by β-actin and represent the expressed values from each donor tested. Panel D specifically shows the kinetics of a representative donor (donor B) after the different viral peptide exposures relative to the negative value (unstimutated cells). To determine the best target cytokine for assessing epitope-specific memory T lymphocytes reactivation, gene amplification of four cytokine, IFN-γ, IL-2, IL-4, and IL-10 was estimated by qRT-PCR. Cytokine mRNA levels were measured over 48 hours following ex vivo peptide exposure of PBMCs from three HLA-A*0201 subjects. Since approximately 90% of the population has been exposed to Influenza, we initially analyzed the response to the peptide FluM158–66 (GILGFVFLT). After 3 hours large quantities of IFN-γ transcripts were detected, but little or no IL-2, IL-4, and IL-10. Maximum levels of IL-2 transcripts were detected at hour 24. IL-4 and IL-10 transcripts levels increased above baseline level after 24 hours and continued to rise up to 48 hours from stimulation (Fig 1). Although IFN-γ transcript rapidly decreased during the 48 period, significant levels were still detectable at hour 12 in all three donors. These results show that following ex vivo peptide stimulation of memory T cells, IFN-γ precedes IL-2, IL-4, and IL-10 transcription. Since IFN-γ transcripts were the earliest and most abundant transcripts, we further characterized IFN-γ mRNA expression in response to other ex vivo peptide stimulations. The three HLA-A*0201 donors were stimulated with CMVpp65495–503 (NLVPMVATV), FluM158–66 (GILGFVFTL), and the irrelevant Mage170–178 (VRIGHLYIL) peptides. Analysis of the response curves showed that CMV stimulation did not result in the same transcription kinetics of Flu (Fig 2, donor A and B in panel B). IFN-γ transcription levels upon Flu stimulation were greatest after 3 hours and showed a linear reduction (Fig 2, panel A). 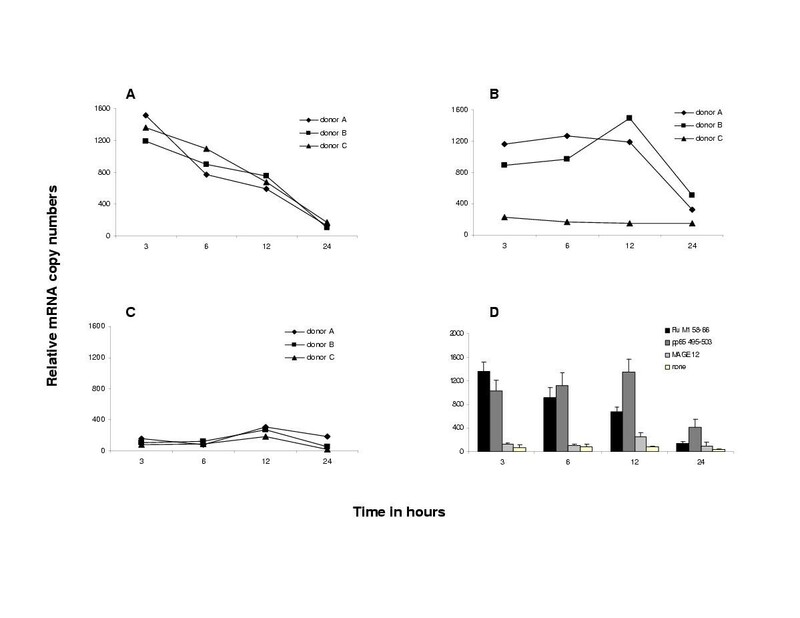 In contrast, IFN-γ transcription levels after CMV stimulation varied but did not differ significantly between 3, 6, and 12 hours before falling drastically after 24 hours (Fig 2, panel B). Stimulations of all three donors with the irrelevant Mage170–178 and stimulation of the CMV-seronegative donor with CMVpp65495–503 failed to induce IFN-γ transcription at any time point (Fig 2, panel C and donor C in panel B). Effect of cell concentration on the specific kinetics of IFN-γ transcript production during CMVpp65 495–503 peptide stimulation. Different concentrations of PBMCs from two CMV seropositive donors and one CMV seronegative donor were ex vivo peptide stimulated and analyzed at hour 3, 12 and 24 of sensitization for IFN-γ transcript production. For all donors tested, panels A, B and C show IFN-γ transcript production for each time of exposure (hour 3, 12 and 24, respectively) relative to cell concentration. Inversely, panels D, E and F show IFN-γ transcription for each quantity of stimulated cells relative to the three times of exposure only for the two seropositive donors. All results represent the mean ± SEM of three independent experiments carried out in triplicate. To investigate the reasons for differences observed in the kinetics of IFN-γ transcription between CMVpp65495–503 and FluM158–66 peptide stimulation, we tested whether concentration of responded cells could affect such kinetics. Thus, the correlation between IFN-γ mRNA production and number of lymphocytes exposed to CMVpp65495–503 was explored. PBMCs from all three donors were stimulated ex vivo at various concentrations of 1 × 105, 2 × 105, 1 × 106, 2 × 106cells/200μl with CMVpp65495–503 and evaluated at 3, 12 and 24 hours. We found that at the 3-hour time point IFN-γ transcription increased directly with cell concentration (Fig 3, panel A), but after 12 hours IFN-γ transcription reached a peak at intermediate concentrations (2 × 105 cells/200μl) (Fig 3, panel B). At hour 24, IFN-γ transcription was low and similar at all cell concentrations (Fig 3, panel C). 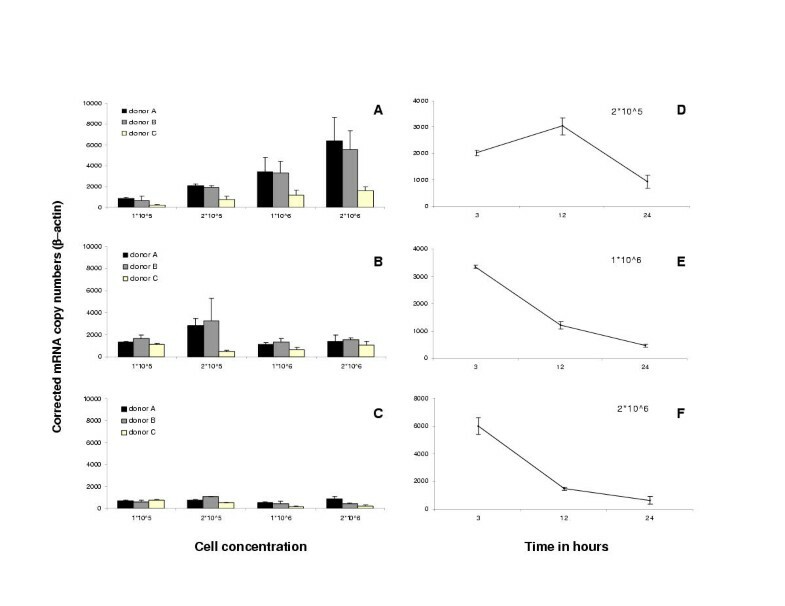 Interestingly in this experiment, the kinetics of IFN-γ transcription were similar to the results observed previously with CMVpp65495–503 stimulation (Fig 2, panel B) only when cells were tested at a concentration of 1 × 105 (data not shown) and 2 × 105/200μl (Fig 3, panel D). Conversely, the slopes of both curves obtained at concentrations of 1 × 106 and 2 × 106 cells/200μl (Fig 3, panel E and F) followed a decreasing IFN-γ transcription kinetics similar to that displayed by flu stimulation (Figure 2, panel A). To determine if other measures of IFN-γ could be used to effectively evaluate T cell activation following ex vivo stimulation, the kinetics of IFN-γ protein release was assessed. Following various durations of exposure of PBMCs to either FluM158–66 or CMVpp65495–503, cell supernatants were analyzed for IFN-γ protein release. From 3 through 48 hours after sensitization, IFN-γ protein release by PBMCs from the seropositive subjects was not or only slightly different from the protein release by PBMCs from the seronegative subject (Fig 4, panels A and B). In contrast, when the cells where sensitized for 2 weeks and boosted with the same peptides, IFN-γ protein production was 10-fold higher, confirming that it is possible to use protein production to estimate the T cell response when in vitro cell sensitization is carried out (Fig 4, panel C). Conversely, the IFN-γ intra-cellular staining was consistently positive upon ex vivo stimulation with CMVpp65495–503 peptide and moderately positive with FluM158–66 peptide (Fig 5). No evidence of intra-cellular protein accumulation was observed at different time points tested before the standard 6 hour sensitization (data not shown). Assessment of the IFN-γ protein release kinetics by ex vivo peptide-stimulated PBMCs. 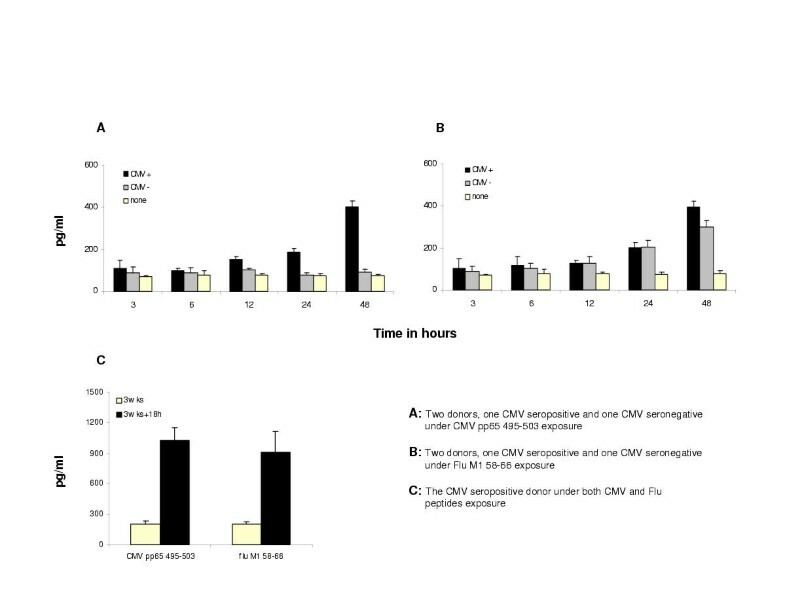 Two donors, one CMV seropositive and one CMV seronegative, were exposed at various durations of time to both FluM158–66 and CMVpp65495–503 peptides and cell supernatants were analyzed for IFN-γ protein release (panel A and B). Panel C shows the protein release from both FluM158–66 and CMVpp65495–503 2-week sensitized PBMCs from the CMV seropositive donors either after an 18-hour peptide re-exposure or after no peptide re-exposure. Results represent the mean ± SEM of three independent experiments carried out in triplicate. IFN-γ Intracellular Staining (ICS) after the standard six hours peptide exposure. All donors were exposed to both FluM158–66 and CMVpp65495–503 peptides and then analyzed for intracellular IFN-γ protein release. 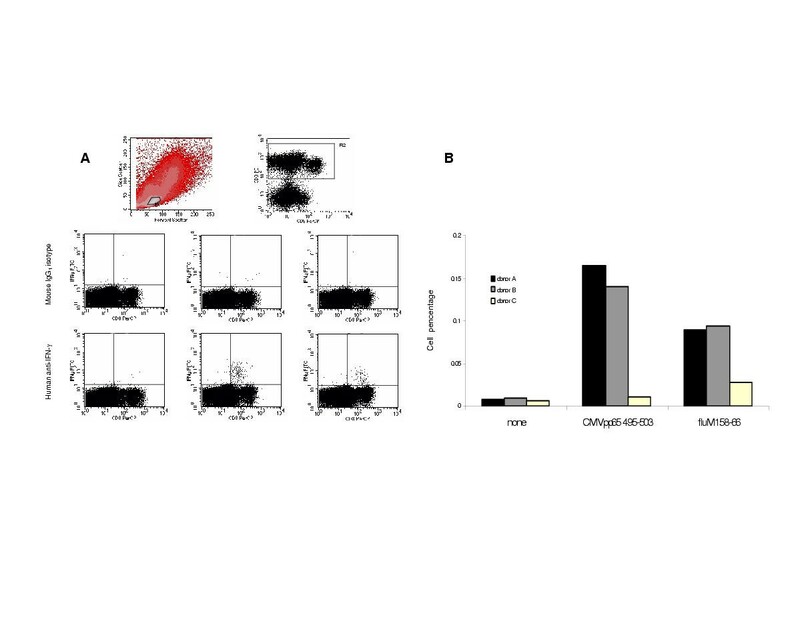 Panel A: FACS analysis was conducted on gated CD3 positive lymphocytes after selecting only viable cells (R1 and R2) and plotting CD8 positive (x-axis) against either mouse IgG1 isotype-stained (y-axis, upper row) or human anti-IFN-γ-stained (y-axis, lower row) lymphocytes. The figure shows one representative experiment of three carried out on each donor. Panel B: IFN-γ ICS results in 3 different donors. The calculation of the percentage of antigen-specific T cells was performed based on the CD8 and IFN-γ dot plot data according to the following formula: Percentage Ag-specific T-cells = Percentage Upper right quadrant /(Percentage Upper right quadrant + Percentage Lower right quadrant)* 100%. Memory T lymphocytes represent a population of active immune effectors that retain a prior stimulus and evoke a stronger and more rapid immune response after a secondary immunization. Among the cytokines produced after immune reactivation, IFN-γ is released within a few hours after stimulation. IFN-γ is produced in response to antigen-specific stimulation by cytotoxic T lymphocytes (CTLs) and inflammatory CD4+ T cells (Th1) and their precursor (Th0) or nonspecifically by natural killer (NK) cells . Its levels are an indicator of the immune activity of armed effector T cells. The evaluation of memory T cell reactivation can be performed between 3 to 12 hours irregardless of the source of peptides. Initially, cytokine mRNA transcription was tested against 2 × 105 PBMCs by using FluM158–66. Flu sensitization displayed the greatest rates of IFN-γ release 3 hours after stimulation. In spite of the inverse correlation of the transcript levels to the time of exposure, FluM158–66 maintained significant amounts of IFN-γ transcription during the 3 to 12 hour period. In contrast, peak IL-2, IL-4 and IL-10 mRNA did not occur until 24 to 48 hours after peptide sensitization. Conversely, CVMpp65495–503 stimulation displayed different IFN-γ mRNA transcription kinetics regardless of cell concentration and periods of exposure. However, studies of the kinetics of expression of the four cytokines revealed that IFN-γ mRNA can be detected either after both FluM158–66 and CVMpp65495–503 peptide stimulation between 3 and 12 hours at the standard concentration of 2 × 105 cells. These results suggest that it is possible to vary the time of cell analysis from 3 to 12 hours after peptide stimulation. In some cases it may be necessary to analyze cells more than 3 hours after stimulation due to variations in the interactions between HLA antigens and peptides. Our group has already found that analysis of cells 5 hours after peptide exposure enhanced the ability to detect HLA-A*0301, A*3301, and A*3303 interactions with CMV pp65 peptides [21, 22]. Different types of assays have been used to identify CTL specificity by measuring IFN-γ protein levels including ELISA, ELISPOT and intracellular staining (ICS). While both ELISA and ELISPOT assays are effective, they have the major disadvantage of requiring that cells are stimulated and cultured for several days or even weeks before monitoring immune T cell activity . Moreover, prolonged cultures of sensitized cells may lead to the artifactual expansion of irrelevant cell populations. Consistent with the fact that a 3-hour sensitization is a short time for mRNA translation and protein production or for the proliferation of a sub-population of responding memory T cells [24, 25], we found that protein detection assays failed to detect activated cells when carried out on unexpanded PBMCs demonstrating the higher sensitivity of the technique we used to induce and detect a T cell response after few hours [26–29]. The ancillary use of ICS or IVS protein detection assays to investigate the specific immune activity of potential immunodominant peptides is helpful in completing the understanding of how those peptides work in the context of specific immune reactivation. In conclusion, we confirmed that molecular analysis by qRT-PCR was effective in identifying immune activity of viral peptides by reactivation of stimulated memory T cell from seropositive HLA-restricted donors after only 3 hours. The secondary immune response resulted in a strong Th1 cytokines production (IFN-γ and IL-2) within few hours. Negative results obtained following tumor-peptide stimulation of PBMCs from subjects not exposed to tumor antigens or subjects seronegative for the target viral antigens confirmed this finding. By using this method we were able to confirm the immunogenicity of the peptides FluM158–66 and CMVpp65495–503 [30–32]. The major practical advantage is that it allows the rapid evaluation of immune memory T cells reactivation by the detection of specific cytokine gene profiles. It makes it possible to screen a large number of viral and/or tumor epitopes and to study their immune activity in a short period of time, with high specificity and without handling large quantities of cells. The strong response after viral restimulation and the ability to use seropositive donors make this method valuable for any disease-related viral peptide investigation.